Beautiful Wedding Stationery for Carrie and Gavin's big day. Their Wedding Stationery set included Invitations, RSVP cards and Additional Info Inserts. "For my wedding invites I was looking for something out of the ordinary, something that captured our personalities and wasn’t your standard ribbons and bows. We originally had invites made up and they just weren’t "us" I was a bit down about it when I came across Hannah’s work completely by accident. I emailed Hannah straight away explaining my situation and didn’t expect her to be able to fit me in at such short notice but Hannah was wonderful, she told me not to worry and she could definitely help me. I gave Hannah a brief description of myself and my fiancé and off she set to work. In no time at all Hannah produced a gorgeous illustration, I was absolutely blown away at how she managed to capture our personalities perfectly. 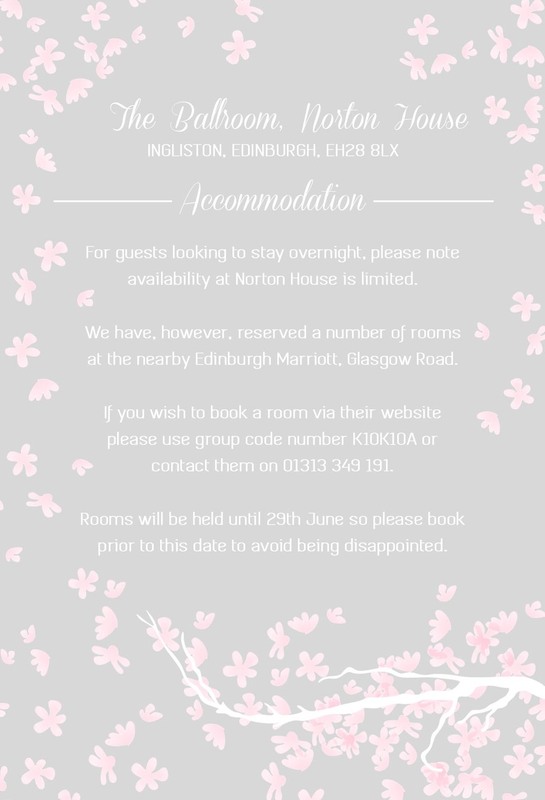 I asked for Hannah to continue our cherry blossom theme throughout the invite and they turned out fantastic! We even managed to find ribbon that matched perfectly to bind them together. The comments we received back from the guests have been amazing to hear! "Nicest wedding invitation I’ve ever seen" "I cant stop looking at it, its so pretty" "I keep it in my bag just to pull it out and show everyone" are just a few of them. I wish Hannah could have done all my wedding stationary!